A fine of 250 pesetas from the Civil Government of Gipuzkoa to Joaquín Rivera Barnola. The reason: he spoke in Catalan by phone from the Europa Hotel in San Sebastián. It is June 1937: a year after the beginning of the Civil War, and almost two before its end. Notice the derogatory reference to Catalan as a “dialecto”. Some politicians and the media of the Balearic Islands from time to time – especially when elections are approaching – try to play out the card of the supposed linguistic problems of the autonomous region. However, the inhabitants of the islands do not see any such problem. This community has long accustomed to Catalan/Spanish bilingualism, with a relatively strong implementation of the use of Catalan in all areas of life, and has managed to seamlessly accommodate both the large waves of immigration workers (earlier from the Hispanic peninsula, mainly from Andalusia, but recently also from Africa and Eastern Europe), and the ever growing presence of international tourism. Of course, occasionally there is some discussion. Yesterday, on a meeting of our neighborhood community around Studiolum’s sea-shore Tusculanum someone said that he approached in Catalan one of the masons working on his house, who has responded with a wry face, saying: “To me, speak in Christian!” And we got over the case. 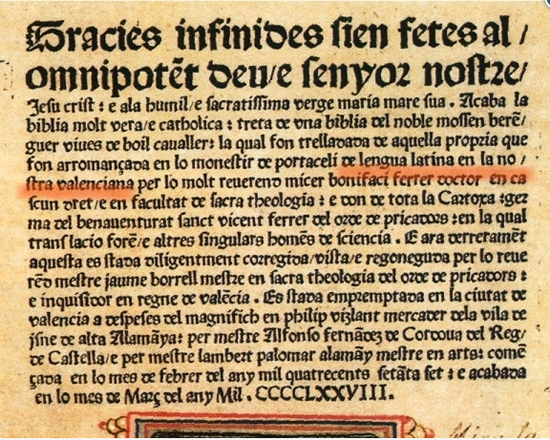 Colophon of the first Catalan Bible, printed in Valencia in 1478. The translation is usually attributed to fray Bonifaci Ferrer – the brother of Ferrer Saint Vince –, while some attribute it to Berenguer Vives and Daniel Vives. The terh “Valencian language” used at that time was not yet charged with the same connotations with which today’s adversaries of the Catalan linguistic unity try to charge it for political reasons. 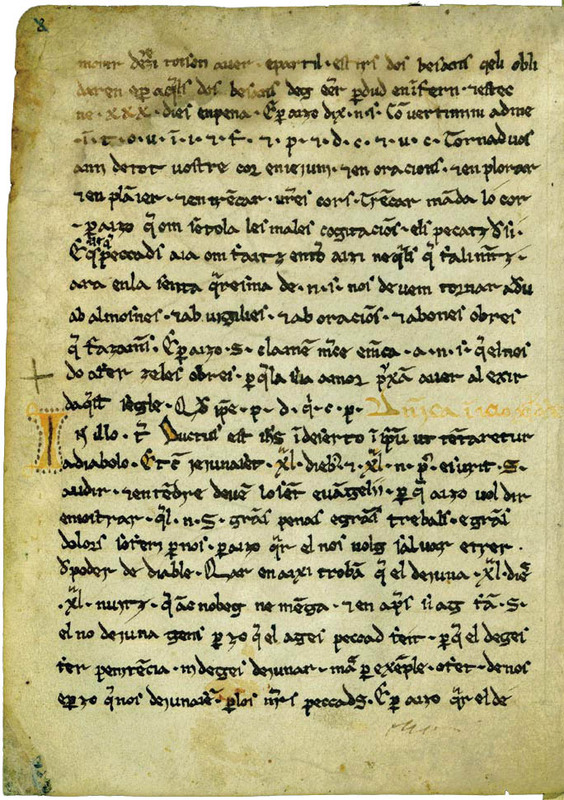 This was the third translation of the Bible printed on any modern language. It is as if to say: we end up with any principle of order in the Catalan language, there are no common rules, no minimum standards of a common grammar and spelling: we reduce the language to the casual, familiar use which is enough to talk to our old grandparents, because, if it depends on us, our children will no longer speak it, and of course will not need it for anything. They will read the Catalan literature in translations… If Raimundus Lullus, Ausiàs March, Carles Riba or among the contemporary classics mossèn Llorenç Riber or Francesc de Borja Moll heard this, they would jump out of their graves! 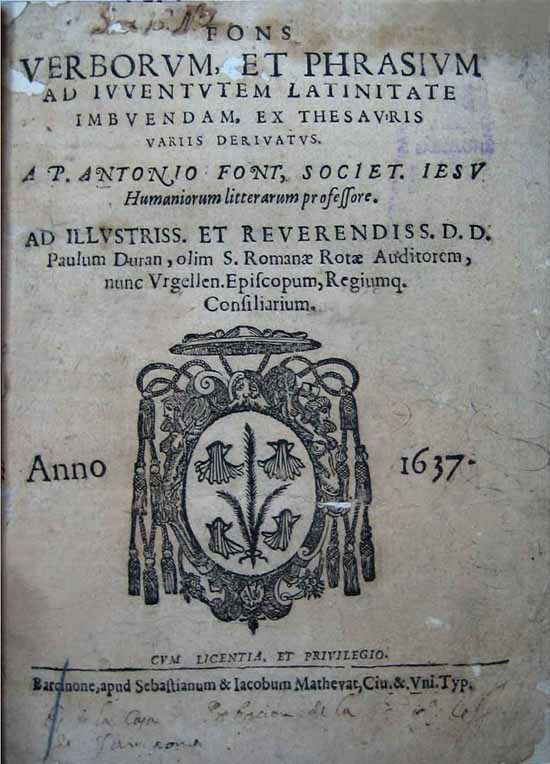 The Catalan-Latin dictionary, published by the Jesuit Antoni Font in Barcelona in 1637, contains a special section with the first spelling rules of Catalan. On hearing such a colossal blunder, we have to ask ourselves, why Bauzá stopped at “Formenteran” (what the hell would that be?). Why had he no courage to go further and request textbooks in the dialects of Pollença, Sóller, Felanitx and other villages of Mallorca, for ber ween these there are just as respectable differences? The purpose of the present language model in the schools of the Balearic Islands is that students by the end of compulsory education are able to express themselves in both official languages (in Catalan as their own language and in Spanish as the language of the state). The educational experience of recent years shows that the most appropriate way of achieving this objective is if Catalan has a clearly superior presence to Spanish in the school system. If not, then the students not knowing Catalan from home, will end up with a very deficient knowledge of it, and will be unable to communicate fluently. The present sociolinguistic situation (that is, both the almost exclusive use of Spanish in many areas of life, and the inertia of behavior in interpersonal uses) explains that using both language at an equal time, or favoring Spanish would result in very inadequate skills of Catalan with many students. In other words, the school in the practice does not guarantee the effective bilingual skills of students. Apart from the personal disadvantages that may come of this in certain areas, in the context of linguistic minorization the increasing presence of people monolingual in the expansive language will increasingly contribute to the difficulties of the overall (active and passive) use of the minority language. The minority status of a language is also deepened by the diffusion of the social representation of its linguistic fragmentation. The aim of this is to make perceive the number of the language users, both within the respective community and outside of it, less than in the reality, especially nowadays, when the demographic size of linguistic communities especially influences the extent of its actual utility in all its functions. The territory where Catalan is spoken is politically fragmented by four state borders and within the Spanish state by five further regional borders. Although Catalan is one of the most uniform Romance languages, this division is exploited to a great extent to represent administrative borders as linguistic borders. In the case of the Balearic Islands, from the beginning of the 20th century in such historical situations when the official and public use of Catalan was achieved, certain sectors of political power started to stress the image of linguistic fragmentation, either in the form of political separation, or of the refusal of an uniform name of the language, or in an overstressed particularism. The aim is to hamper the increase of the use of Catalan. In this sense, if they manage to achieve that the users of the language do not accept its unity, its realistic linguistic dimensions and its common, standard language version, and to regard only the dialectal versions as their own, it would prevent its use as a common language suitable for all uses. For example, if they claimed that students should use textbooks published in the linguistic varieties of the individual islands, it would in practice prevent the existence of books in Catalan. However, the fact that the Balearic Islands is constituted by four inhabited islands, each with a strong sense of identity, makes it difficult to oppose a common Balearic reality to the dominant language, and reinforces such delusional and unrealistic ideas as the above which intends to publish textbooks in the four main insular language varieties. We should add, that – as it often happens with ideas born in the election fever – once he won the elections, José Ramón Bauzá has loosened up his cravings for the destruction of Catalan in the Balearic Islands. We know that in his own team of government there are people who advised him to think about it a little better. We’ll see what the next step will be when, according to all polls, the Popular Party will win the upcoming national elections on 20 November, and will accelerate the already powerful centralizing efforts of the Spanish state. But the classic literature already needs a varying degree of translation for the grade school students... and with a proper government subsidies and policies, a region could create tons of contemporary local literature in a very short time. Like in Iceland, pop. 270,000, which has the highest poetry output per capita by a large margin. Why? Probably because the govt effectively blocks employment of youth under 21, while at the same time subsidizing poets. To every kid with a garage rock band, the path is clear. That fine has been widely circulated (it is a favourite of my nationalist friends) and you do the right thing by mentioning that it happened during the Spanish Civil War. 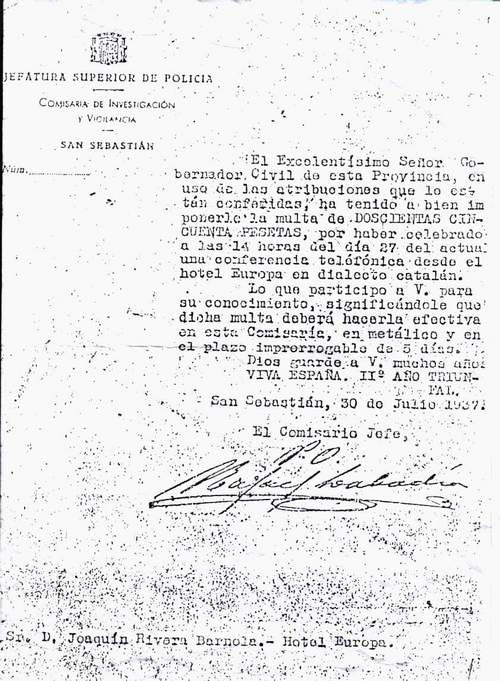 I think one more element of context if missing: in July 1937 San Sebastian and the rest of Guipuscoa were in Franco's hands whereas the whole of Catalonia was in the Republican zone. In my opinion it may be a lot more about the Civil War and control of communications than about Catalan language policies. Unfortunately the fine does not refer to any law of decree, which could clarify it. alfanje: yes, I did not add that element because I thought the date made it clear for any reader. I’m also convinced it was because of this political situation; I doubt he would have been fined by speaking in Basque on the phone. The recent neutrino velocity paper seized on by the press for travel faster-than-light (Einstein wrong, time machines etc), is interesting for the use of GPS to measure the distance between the neutrino source at CERN (Geneva) and the detector, deep underground at Gran Sasso. The distance of 730 km was measured to a precision of 20 cm. (The measurement also revealed continental drift - less than 1 cm/year - and a sudden displacement of 7 cm from a local earthquake). So, all things considered, I don't think the navigation of your heavy trucks should be blamed on GPS. In London, would-be taxi drivers still have to acquire "the knowledge". GPS is far too modern! Well, I mean their GPS is obviously correct, for they all manage to arrive here. What is wrong instead, is the map in their GPS, which indicates the way from here to the industrial zone as passable, instead of a dirt way which it is in the reality. The same refers, mutatis mutandis, to the maps of Urbino and Barcelona, too.